The problem with Italian cookbooks is they make me pine for Italy. (See my infatuation with Rome from two summers ago.) July marked fourteen years since I've been back, so when I began reading page after page about tomatoes and chestnuts and garlic in Guilia Scarpaleggia's From the Markets of Tuscany, my heart simply burst before I was even halfway through. The antidote, of course, is heading into the kitchen. Giulia and I first became acquainted through blogging. (She even wrote a dreamy Literary City Guide to Florence.) Her Tuscan blog, Juls' Kitchen, is a favorite of mine, and when I learned her latest cookbook was set to be published in English this spring, I promised to be first in line. The cookbook is organized by market, which any traveler will tell you is probably one of the best ways to explore a new town. Giulia traversed Tuscany meeting vendors, sampling local specialties, and then took that inspiration straight to her Tuscany kitchen to bring the flavors home. Traveling around Tuscany for over a year to visit its weekly, large indoor and smaller organic markets was a learning experience, one that helped me to better know and love this region I call home—my place in the world. While I was lost in small talk with local producers, buying everything from honey and local cheeses to pork fat sausages and fragrant peaches, my partner Tommaso would follow me with camera in hand, capturing what was unique about every market and how each differed in character and changed with the seasons." Who play around us, country girls clapping their hands. You with loose hands of abandonment hanging down. Thanks to a dusty copy of the Norton Anthology of Poetry, D.H. Lawrence was one of the first poets I ever learned about. So you can imagine my delight when searching for poems that celebrated almonds, in any small way, I came across these lines of verse that begin by revealing "early love that hardly has opened yet." When we move to the almond tree, there's tranquility under its branches throughout Provence, Japan, and Italy (perfect for the recipe to follow). For a moment we're transported, resting somewhere in the shade. By the end of the poem, there's a play on "a flowered gown" which could either be the poet's beloved, or the almond tree, with all its "unbearable tenderness" and "loose hands of abandonment hanging down." Something has changed. We're not privy to the details, whether the relationship has stalled, affection has wained, or the almond tree simply stops bearing nuts year after year. I suppose the only place of refuge is back under the almond tree that "flowers on the street," and the daily ritual of going to the fence, looking for flowers, wondering what they mean. Sometimes we must sit with our questions, and resolutions take their own time to reveal, both in life and in the poems we read to enhance our days. This recipe is lightly adapted from the pages of From the Markets of Tuscany by Giulia Scarpaleggia. Inside the cookbook, there's an entire page dedicated to the history of biscotti. Read it and you'll learn the word biscotto means "baked twice" in Italian, and that they came about in response to conservation—they'll stay fresh in a closed tin for up to two weeks. There are also notes on Antonio Mattei, who opened his first biscotti factory in 1858, in Prato, northwest of Florence, and although the bakery is owned by another family now, you can still visit there to taste these sweet little cookies. 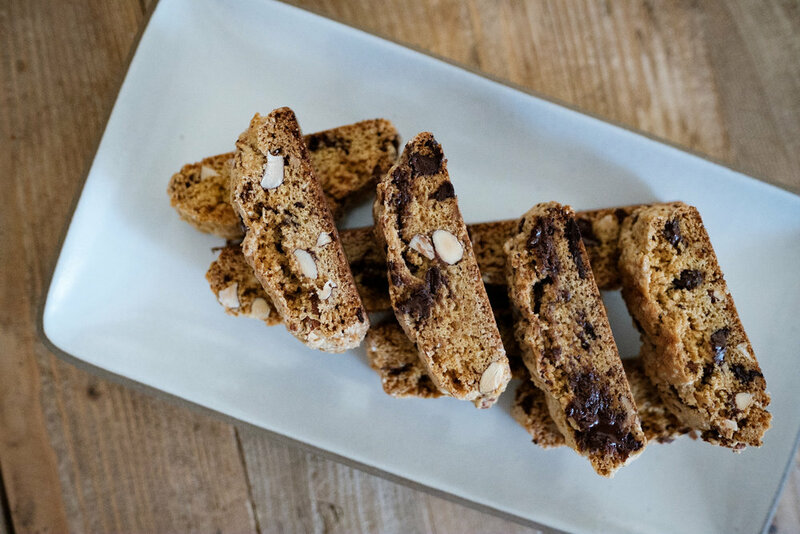 Giulia's basic recipe is for almond biscotti, and she shares four variations to try. I combined two of the suggestions to make a dark chocolate and almond version I was so happy with it made me wonder why I hadn't been making biscotti part of my holiday baking routine for the past few years (they'll make perfect edible gifts this season!). Heat oven to 480°F. Add 2 eggs plus 1 yolk to the bowl of a stand mixer. (Save remaining egg white to use later.) Add sugar to the stand mixer and beat with the eggs until light and frothy, about 1 minute. Soft flour, baking powder, and salt over the mixer, then add the orange zest and mix on low speed until dough comes together. Add almonds and dark chocolate and fold in with a spatula. When the first bake is done, the biscotti should be golden on the outside but still tender inside. Let cool 5 minutes, then transfer logs to a cutting board and slide into 1-inch pieces. Arrange biscotti back on the baking sheet and bake for 15 minutes, or until golden. Let cool completely on a rack before enjoying dunked in your coffee (or plain! ).